Through our Older Adult Guardianship program, we are able to provide services to a specific set of vulnerable older adults, termed the “unbefriended”. The “unbefriended” lack the capacity to make decisions regarding their health and well-being, often due to a cognitive impairment such as dementia. 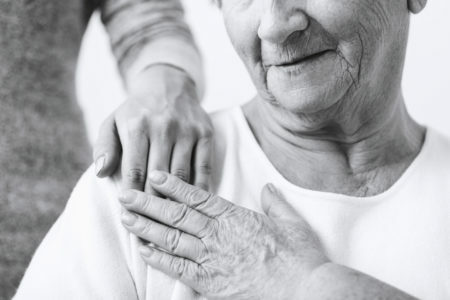 In addition to diminished capacity, these individuals face added challenges because they have no written outline of their care preferences (Advance Directives) and have no identified “surrogate”, such as a family member or friend, to assist in decision making. As a result, many of these individuals find themselves stuck in the hospital without anywhere to go. Unbefriended patients and the hospitals where they reside, have very few resources. LFS has been serving the older adult community for nearly 30 years, and with our expertise in aging issues we are uniquely qualified to provide guardianship services to this specific set of vulnerable older adults. The role of a guardian is to make decisions regarding the patient’s health, and welfare. Our person-centered approach, coupled with services and supports tailored to the individual’s needs and preferences, achieves positive outcomes for this group of older adults in areas of safety, health, housing stability, and overall well-being. Our Older Adult Guardianship program works directly with hospitals to assume responsibility for the patient, discharging them to an appropriate living facility, and providing support for the duration of their life. There are a variety of ways you can support the older adults in our Guardianship program. Through our Friendly Visitor Program, you can help reduce isolation of vulnerable older adults and enrich their quality of life through social and intellectual engagement. When a patient is ready to leave the hospital under the guardianship of LFSRM, we provide them with essential items needed by each patient including toiletries, clothing, and other items to make their new living environment more comfortable. Putting together a Moving Basket makes a huge difference as they move to their new living environment. We always need help with fundraising and other financial assistance. 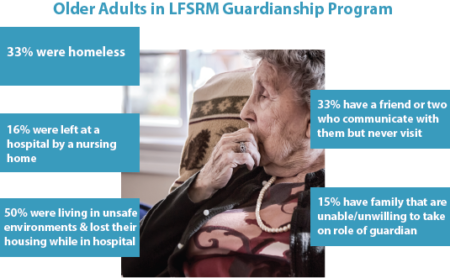 If you cannot donate your time, but still want to participate in assisting these vulnerable older adults, consider making a financial donation to the LFSRM Older Adult Guardianship Program.